As was mentioned before, flu or whatever illness took its toll on Jon's voice, but the rest of the band was excellent, and I'd love to get a copy of this show if anyone has it. Please e-mail me at jcostello716@yahoo.com. Thank you! At the end of the show, before the encores, everyone in the band was going over to Jon to give him a little encouragment and a pat on the back. Alan put his arm around jon and said, "I can't beleive you made it that far........."
Jane was being the ultimate Yes Cheerleader per usual making a lot of hand gesutres along with the music. At one point at the end of a song Chris did a little Jane-like hand gesture in her direction which had them both cracking up. Later on Jane sort of threw her arms back in a Chris-like move and in response he really thwaked his Rickenbacker and struck one of his one-legged poses with a funny face. They were both laughing at each other through a lot of the show - it was fun to watch. At the end of Perpetual Change (?) Steve was really vocal about something - that's when Chris went over to him and said something with a smile. Steve was saying something and gesturing with his thumb and forefinger - he said something like it was only off that much, or it was off that much. I didn't notice as was reported earlier that the sound on his guitar was off at the beginning. A lot of people, more in reviews of the OYE tours have given billy a hard time for not adding much. I'm not a big fan of his rabin-style solos, but we sat right in front of him and could hear him quite well in the mix. He certainly did add quite a bit sometimes playing a counter lead part, sometimes adding to the rhythm and doubling Chris's bass lines - he is a very good addition and on this tour they've worked him into the arrangments quite a bit more. 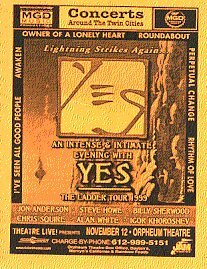 I'm a great fan of Steve Howe and in my estimation Billy helps open up room onstage for Steve and he adds a level of intricacy to the arrangments. The whole show ran slightly over 2 hours including the Firebird Suite. Someone earlier complained that the best hour of the show was dropped - but Awaken and Nine Voices would only run about an additional 22 minutes. Jon when he talked or sang acapella (Time & A Word, Nou Sommes) sounded awful. I'm sure he also dropped both of those pieces an octave - especially Time and A Word. I was amazed at how well he did sound on all of the other pieces. He did seem rather dazed during a lot of the show though. Somewhere near the very end of the show he took one more Instamatic shot of Jane and then handed the camera back to her and gave her a kiss. I didn't really talk to a lot of people after the show, but as I was leaving, I didn't hear any loud complaints about the short show - people seemed to be pretty bouyant none the less. I think overall the crowd was very gracious and understanding. I saw a Lilith show in 98 when Sarah McLaughlin got food poisoning and did not perform - wow were people *really* mad about that even though they did get a full day of music (the other performers played longer to make up a little bit, knowing at best she'd only do a short show.) 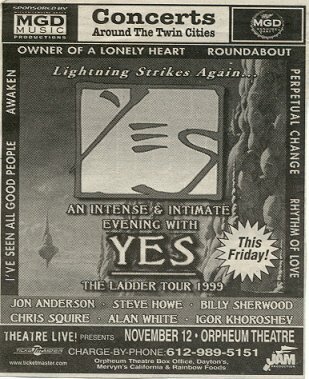 I think it's a testimony to the good will of Yes fans that folks were not upset. I especially wanted to hear Awaken, but over the show had plenty of Yes magic to offer. By coincidence we stayed at the same hotel as the band. We saw Billy checking out the next morning and spoke with him briefly. As we left, saying goodbye, he said, "See you next time......"
I just got back from the Minneapolis show. Unfortunately, Jon was quite hoarse tonight and, after apologizing frequently for the status of his post-flu voice, decided not to play Nine Voices and (horrors) Awaken. Since I wasn't very enthused with the posted set list, I was very disappointed with the omission of Awaken. I wish they had omitted a different song instead. Actually, I didn't think his voice sounded too bad except for when he spoke. I also was disappointed that the segment of Ritual was only about 30 seconds long. The set list was the same otherwise as has been posted previously. Chris was quite a showman and Steve, though sounding great, seemed as low-keyed as others have reported. Some highlights were And You and I, Perpetual Change, and Yours is No Disgrace. The show lasted about 1:45. Another thing that surprised me is that Steve either sat out on the three 90125 songs or else played rhythm guitar. Other than that, a great night; Jon's voice was obviously strained, but he pressed on valiantly anyway. Toward the end of the show, it was obvious that Jon's voice was getting worse and he explained that the next couple of songs had two many high notes for him to attempt. I saw Steve going over to change guitars and thought we might get some solo songs from him to fill the void, but no such luck. Losing Awaken was a disappointment, but other than that, the show was a lot of fun. The band looked to be having a good time, the new songs sounded better than I had expected and it was great to hear some older things like Perpetual Change and Yours Is No Disgrace. After the show, I got a chance to talk with Alan a bit. He said that Jon's voice has these problems occasionally and all they can do is rest it and wait. Hopefully, it will be ready for Milwaukee and Chicago. He also said that he was happy to be playing all of Perpetual Change again-he couldn't remember the last time they'd done it without chopping it up for inclusion in a medley. Also, they had had some management meetings that day in Minneapolis and made some decisions about where the tour will go in the new year. It's good news for fans in Australia. He said they would be touring 'down under' for about 6 weeks in the new year-don't know exactly when. One more tidbit from Alan: they're talking with Jethro Tull and maybe ELP about a big Prog Rock tour of outdoor amphitheaters next summer. Review: What a bummer of a concert! Yes played great but dropping Awaken really made the concert too short and anticlimactic. Ending on "Seen All Good People" before the encore isn't really a show-stopper. I guess reading this site can set one up for expectations, like how lucky were the folks in LA who got to hear Close To The Edge AND Awaken? The only reason I can see for shortening the set so dramatically was that Jon said he was getting over the flu and he was constantly apologizing for his voice, ironically, he sounded just as great as he always does, I haven't heard a bad performance from him. So, without Awaken, the set was woefully short and a bit of a bummer. 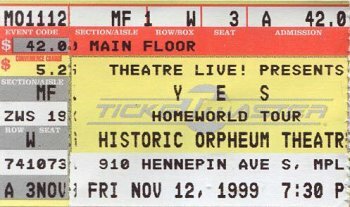 I heard Yes play Hearts and Perpetual Change for the first time but that wasn't enough for me to give this concert the thumbs up. Unfortunately, the guys phoned this performance in. I want to thank you all for being with us for such a long time. Thank you. Appreciate. 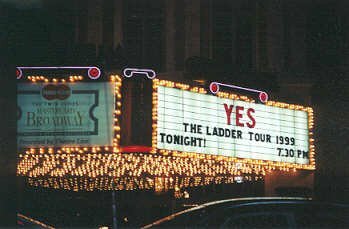 Like to do some songs from 'The Ladder'. The new album..uh I honestly remember started recording this album and we've been together of the road maybe two years and we're still so happy together so the sound of the album was very upbeat, happy sorta thing. The song leads through..uh when lightening strike you. It does so many times and in so many different ways. The song is called 'Lightening Strikes'. Me and Chris has been together 31 years. Long, long time and..uh he's still an amazing bass player. He's still an amazing guy. He's still an amazing bass player and..uh we started to record this next song so I left it up to Chris to find a groove. Him and Alan started this sorta semi reggae thing going and..uh I went to our producer..uh his name is Bruce Fairburn. [???] who's in heaven watching us every night saying "C'mon guys get it right" and he's the sweetest guy in the world and he loved Yes music and helped us make this..uh wonderful record. He said to me one day "Why don't you write a song about someone who influenced you in your life. I told him the [???] of Bob Marley. [???] and one of my children singing Bob Marley songs to me. Made me feel good and..uh so this is a song called 'The Messenger'. Woo! Thank you so much. Thank you. Here's a song from.. Thank you so much. Thank you. Thank you. Thank you. [???] maximum in the house. Good workout. You guys you [???]. Thank you so much. This sorta..uh into our last..uh few days of touring we're been on the road for three months. It's a great place to be able to come and see you guys and..uh I have the chance to wish you a wonderful Christmas and a great new year in to the year 2000. What better guy, what better guy to bring in this song. The one, the only, greatest guy in the world. Our drummer, Mr. Alan White on drums. Alan White on drums. Woo! Can you sing along with this song? Everybody sorta stand in the middle. Okay? In the middle of the song, everybody stand up. Please.